Station Unlimited is my site for all my old audio works and also newer stuff that doesn’t fit into The Overnightscape format. I like to call it “The Overnightscape Underground”. I redesigned the site with WordPress, converting all the old content into posts, backdated to their original release dates. So now, things are better organized and easier to listen to. I just released a very cool “audio field trip” I did last Saturday with my friend Peter, called “The Motor Excursion Ruffians #3”. Also, I released “Audio Street Fair Blues” which I mentioned on The Overnightscape #602. I plan on releasing a lot more cool stuff on Station Unlimited. Last Thursday The White Stripes announced a surprise show in NYC today, at the newly renamed The Fillmore at Irving Plaza. Tickets went on sale 10AM Saturday at the box office – $30 each, cash only, 2 tickets max per person, photo ID required. Instead of a ticket you get a voucher which must be presented with the photo ID to get in. My sister-in-law Carrie and I got on line at about 5:45 AM. As we later found out, we were 124th and 125th in line. We finally got our vouchers at around 11:15 AM. I did a lot of recording which will be heard on an upcoming episode of The Overnightscape. Around 8:00 AM someone took a video of the line. 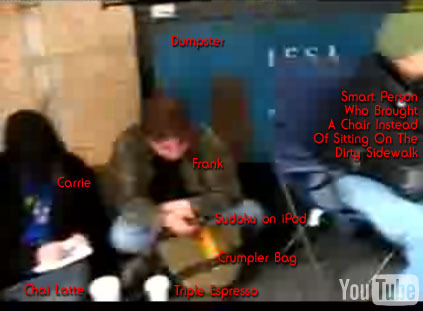 You can see me and Carrie at the 0:50 mark sitting on the ground (1:13 if it’s counting down). She is wearing black and I am wearing green. Rumor has it only 350 people on line got to buy tickets, with another 150 being sent home empty handed. I’m looking forward to the show! 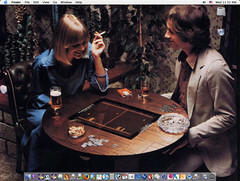 This one has it all… corduroy, cactuses, groovy wallpaper, cigarettes, Pong, snacks, beer, whiskey, and lots and lots of quarters. Episode 600 will be coming sometime this weekend.